A review in 10 words (or thereabouts): Sometimes it's hard to write your own story. Rainbow Rowell has a way with words. I mentioned this before in my Eleanor & Park review. She's a poet really, weaving together descriptions and sentences that sometimes leave you speechless. She is also excellent at dialogue. In many ways it reminds me of John Green. It's smart. Fastpaced. Witty. And leaves me envious of the "Gilmore Girls-esque" quips that were both intelligent and entertaining. Then there are her characters. I loved Cath and her insecurities. I maybe might have seen just a smidgen of myself in the nerdy, wallflower of a college student. Levi. Sigh. Levi is spectacular. From the moment Cath walked into her dorm room and encountered Levi, I was smitten. He's smart, awkward, and genuinely kind. Reagan might be a little rough-and-tumble, but her tough love saves Cath. And that's the true awesome of the story. The characters save each other. Sometimes subtly, sometimes outright, but each, in their own way, find a way to help the other. 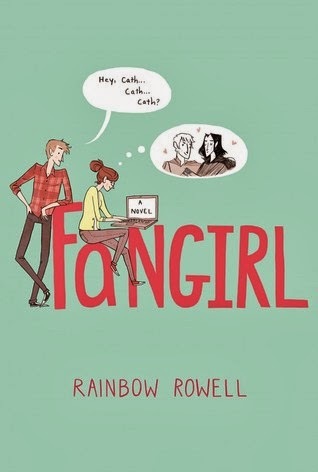 As coming of age stories go, there isn't anything epic in Fangirl. It's really just the story of a girl who finds out she is capable of so much more than she ever dreamed, and that change doesn't always have to be as terrifying as we allow ourselves to believe. I might be fangirl-ing a little over Ms. Rowell's newest novel. She's a spectacular writer And if you haven't picked up one of her books yet, you really should get on that as soon as possible. I read the description of this book and thought it sounded dumb. But then I decided to give it a try since I loved Eleanor and Park. I loved this book so much that when it ended I went back and reread parts of it. I think I probably could have read the whole thing over again. When Cath leaves the library and she hears Levi say, "hey."